The SS-5 form was more valuable to me than the SSDI (Social Security Death Index) in my quest to prove my great-grandfather’s date of birth. Why? Because it had been completed by the subject of my search. Not to mention the oodles of additional information the form added to my understanding of Alfred’s life. Remember when I was inspired by Advanced Genealogy Research Techniques to create an ancestor timeline to break down a genealogical brick wall? Response from the Social Security Administration Division of Earnings Records Operations came so quickly, I thought the envelope contained my earnings records. The first thing I noticed was the street address; 3046 N. Leavitt Street. It matched Alfred’s address in the 1940 census when he worked as a laborer for the park district. This was a marked change from the four previous censuses in which the adult Alfred had appeared. According to the 1930 census, Alfred owned his home at 4217 N. Meade Street in Chicago. He worked as a bread salesman for a bakery, the same occupation listed in the 1920 and 1910 censuses. This was presumably an advancement from his role as baker per the 1900 census. From just these records I can conclude Alfred worked for the same company, Sawyer Biscuit, for at least 30 years. Had he been impacted positively or negatively by the company’s merger in 1925? Chicago’s 3046 N Leavitt Street is currently a multi-unit dwelling. Built in 1904, the 2500 square foot home had been divided into apartments. Four families lived there when the 1940 census was taken. This change in living arrangements and the change in his occupation shows the effect of the Great Depression on Alfred and his family. The next item of interest was the field labeled Business Name of Present Employer. Although I knew that Alfred had worked for the WPA (Works Progress Administration), his Social Security application confirmed that fact and gave more specifics. Like the number 122 and the WPA address of the Merchandise Mart in the city of Chicago. 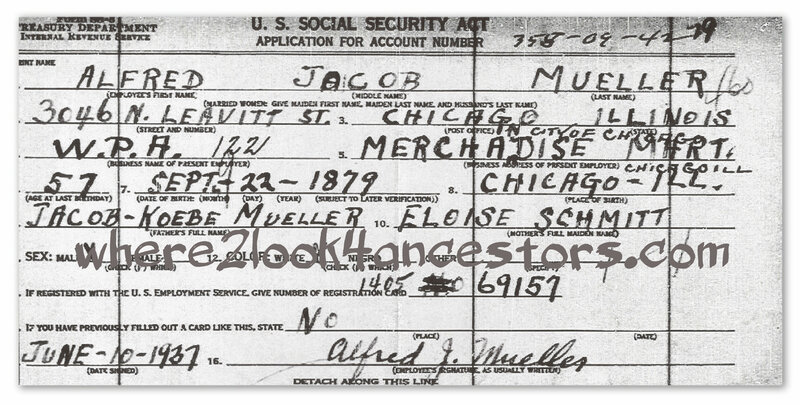 More details about this employment appeared further down the card; If Registered with the U.S. Employment Service, Give Number of Registration Card. Both 1405 and 69157 had been handwritten. Alfred also stated he had not previously filled out a card like this. Was the SS-5 form worth $27? Absolutely! It provided additional information about my great-grandfather Alfred and gave me more clues to pursue. made the SS-5 a valuable tool in my Mueller family history arsenal. Alfred Was Born Wasn’t He? Great insights from the change in address and living situation! How long did you wait for the SS5? Thanks Amy, my research has taken a more serious turn these days. 🙂 Getting the form only took 11 days – surprised the heck out of me! Wow, that’s fast! I somehow remember waiting a LONG time for the one I ordered, but that was a few years back. Very interesting 🙂 I’d love to have docs like this available for my British ancestors… Glad you found so much valuable info! Thanks so much for writing and for sharing your thoughts. It has been an interesting journey!